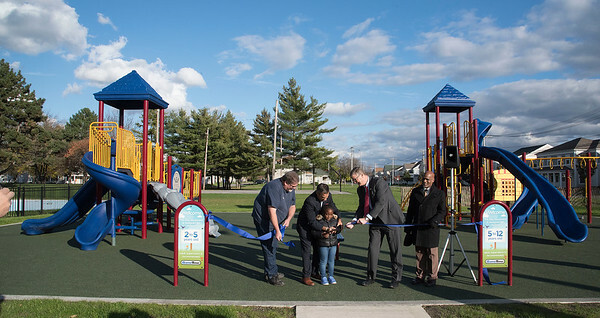 Niagara Falls, NY - Young Kaylee Ware, 5, helped city officials open D'Amelio Park on Center Avenue during a ceremonial ribbon cutting to officially open the park. From left are, Council members Kenny Tompkins, Andrew Touma, Kaylee Ware, 5, Mayor Paul Dyster and Rev. Raymond Allen.